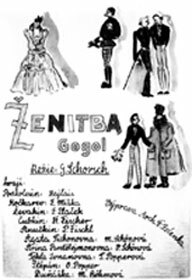 Drawings for Gogol’s Marriage . Gustav Schorsch was born 29.01.1918 in Prague. At 17, he headed an elocutionists' group at his school. The group won an award of Classical Culture Society of Czechoslovakia. He studied drama at Prague conservatory, and at the same time took a philosophy course at the university. He arranged poetic soirees, translated Titus Lucretius Carus, and acted key parts at the conservatory theater. He took part in a play The Lower Depths by Maxim Gorki. In 1939 Schorsch became an assistant to a prominent Czech director Karel Dostal in the National Theater. In Terezin, Shorsch headed the Czech theater section in the Free Time dept. He directed the following plays: Puppets by Petr Kien, Marriage by Gogol, Measure For Measure by Shakespeare, Judges by Calderon and Wit Works Woe by Griboyedov. Contrary to the 'people's artist' Schwenk, Gustav came to the theater from literature. For him, theater was a tool for humanistic and historical education. His guru was Stanislavsky. After the first rehearsals of Wit Works Woe, the cast was depleted by the transports, and Schorsch felt too depressed to resume work on the play. The same happened to The Judges and Measure For Measure. E.M.